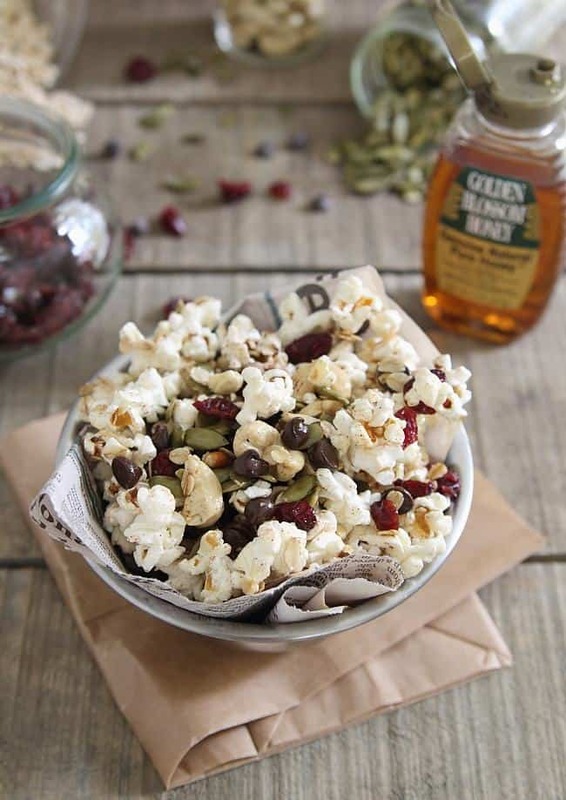 This trail mix popcorn is filled with nuts, seeds, dried fruit and chocolate chips for a fun snack. The pantry door opens. She thinks nothing of it. The sound of plastic being torn open gets her attention though. Ears are now perked and the trademark tilted head expression now looks back at me. I open the microwave and she waits in hopeful anticipation. 15 seconds go by, nothing. She’s still hopeful though sitting eagerly on the edge of the area rug. Pop. Pop pop. She stares intently at me. Pop, pop, pop pop, pop. She now comes prancing into the kitchen, her nails clicking against the hard wood floor. She sits by my side and we wait. I take the bag out, pour it into a bowl and she hops backwards towards the couch banging into something, a chair, the decorative column that divides the rooms, the tv stand, unfazed as popcorn trumps any and all pain in the mind of a dog. For the next 20 minutes, we play the game. A kernel for me, a kernel for her. Her catch rate is usually about 50%, lost under the couch rate about 5%, pure and utter happiness…110%. This is the scene that unfolds every single time we eat popcorn in this house. When it comes to popcorn, while Ginger will eat it any which way, you have to really jazz it up for me to want it. Butter alone isn’t going to cut it. I want caramel, chocolate, spices and any other adds in you can dream up. To celebrate JOLLY TIME Pop Corn turning 100 this month (which also happens to be National Popcorn month), I dreamt up my ideal popcorn combination. Trail mix popcorn. It’s got nuts, seeds, fruit, spice, stickiness AND chocolate. Not quite sure there could be a better combination to celebrate turning a century old. Not only is this snack healthy, family owned JOLLY TIME popcorn is made with non-GMO kernels so you can indulge without any worries. And yes, I know chocolate is bad for dogs. Ginger’s portion was sans chocolate chips and she wants me to tell you she highly approves. Place popcorn, cashews, cranberries, pumpkin seeds, chocolate chips and oats in a large bowl. Pour melted coconut oil on top and toss until well combined. Drizzle honey on top and mix gently until coated. Season with cinnamon and serve. *This post is sponsored by JOLLY TIME and Kitchen-PLAY. All content is my own. What a great idea for a snack. I am a huge fan of all the ingredients, will have to give this a try. Ginger is so cute!! I love that she’s excited for popcorn. Smart girl! Love this fun trail mix version! Trail mix popcorn? This combines two of my very favorite things! This snack wouldn’t stand a chance in our house! Perfect for after dinner snacks or game time watching! Too funny! I had a rottweiler growing up, also named Ginger, who did the same thing! She knew what the sound of cellophane meant. She loved popcorn and carrots (not together, although she probably wouldn’t have minded). I was definitely channeling my inner BHP when writing this :) Thanks, Kristen. What a yummy looking trail mix especially with the addition of pumpkin seeds! Thanks for sharing! FYI — There is no such thing as GMO popcorn. So all popcorn is non-GMO. If Jolly Time told you that its popcorn is non-GMO, it’s just a marketing gimmick, like sponsoring a blogger to promote their product (and not mentioning that it’s a sponsored post). Teresa- Honestly, I had no idea until just now that all popcorn was non-GMO. Great to know and while yes, probably a bit of a marketing gimmick, I can’t say it’s really a bad thing. At least it’s not deceiving you into thinking something unhealthy is indeed healthy for you like the “fat free” labels on many processed food items. And to address your last remark, while I did indeed completely forget to mention this post was sponsored (it is and the post has been edited to say so), unlike your insinuation, it was not purposeful or done in an effort to deceive. There are many sponsored posts on this site over the past 3+ years and I’ve never not disclosed. It was an honest oversight and one I’m happy to correct. Theresa I am President of the American Pop Corn Co makers of JOLLY TIME Pop Corn. We are a 100 year old family business. I would like to assure you that all pop corn, including JOLLY TIME Pop Corn, is not genetically modified in any way. I’m not worried about GMOs. I know they are safe. I don’t agree with food companies that add to the confusion around GMOs with misleading labeling. Dogs are the greatest! Ginger sounds so adorable! We have an air popper machine and the popcorn likes to fly out all over the floor, and my dog (Vader) loves it when that happens! :) What a fantastic healthy snack to make! haha.. I love that your dog does that. So fun! Our dog just wants to eat it all at once, none of this one at a time business… and to be honest if I had this in front of me right now I would do the same thing because it sounds amazing Gina! I love snacking on both trail mix and popcorn.. but never would have thought to combine the two! What a delicious idea! Definitely a yummy snack I can picture myself devouring. What an adorable post! 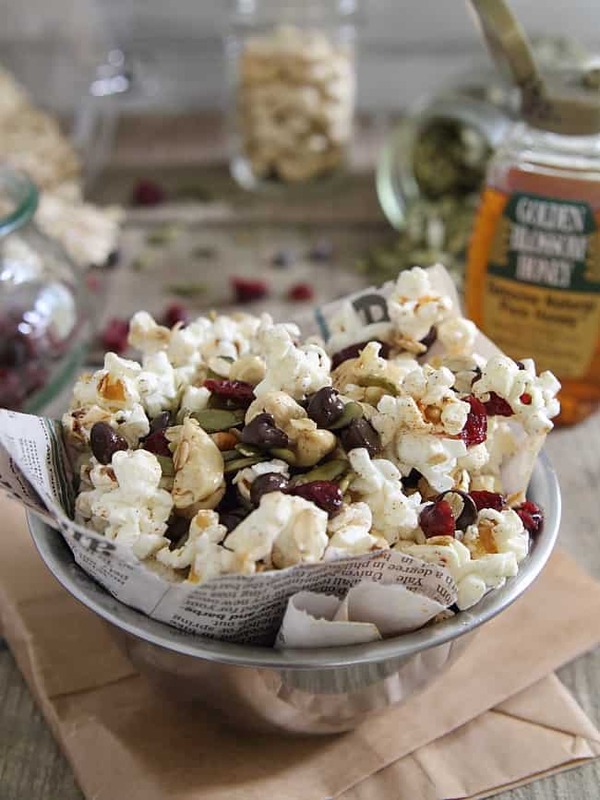 Popcorn isn’t typically my go-to snack, but everything in this IS! Yum! Yum! Chocolate and popcorn! A dream combination. Have you tried the spiced pumpkin seeds at Trader Joe’s yet? They are ah-mazing.